It was my baby brother’s birthday recently and a cake was absolutely in order. By baby I meant he is nudging the upper end of his 30s but in my heart he’s still the funny little boy who used to fall asleep standing up while playing with Matchbox cars. 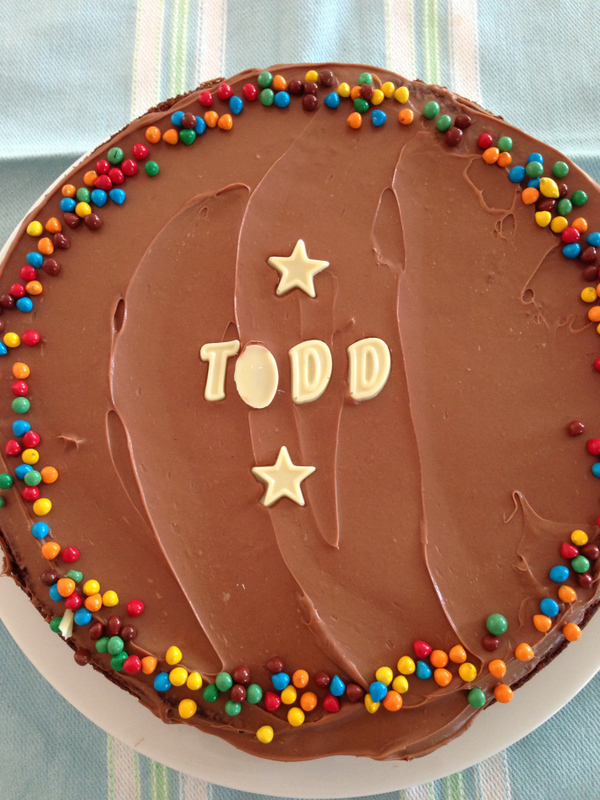 My mum hosted a family lunch and bought my bros an ice-cream cake – sort of as a joke, sort of because he actually requested one. Obviously a real, actual chocolate birthday would also be needed. I found the ideal recipe in David Herbert’s Best Ever Baking Recipes and it was not only a snap to make, it turned out exactly like the photo in the book! Huzzah! It tasted rich and fudgy and decadent – a perfect birthday cake. That is one beautiful cake! Yum! Ta Shannon – it is a versatile cake. The cake looks delicious! What a sweet sister you are! awww, ta 🙂 I am lucky to have such a fab brother. A chocolate fudge cake? That’s the birthday cake of my dreams and yours looks fantastic!